Beautiful (inexpensive) and fun wreath to craft in just a few hours makes a great gift! I used a wire metal wreath form. I selected plastic ornaments in shades of gold, silver, cream and white. I used a mix of shiny, glittery and matte finishes. 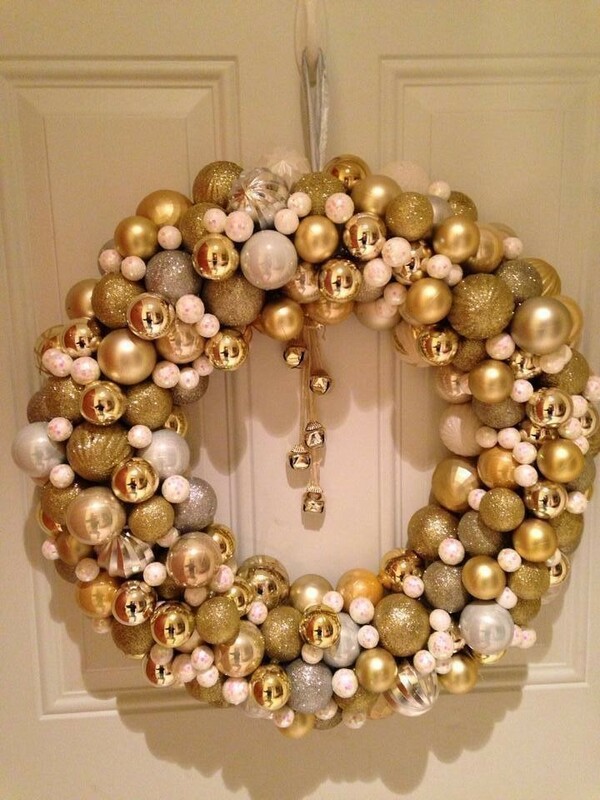 The number of balls required depends on the size of your wreath form. You will need more balls than you expect! Purchase them in various sizes. Wrap ribbon around entire wreath form until completely covered. Glue ends. Tie a looped length of ribbon as a hanger with matching ribbon. Lay wreath form face down. Using hot glue gun, glue larger ball ornaments around the inside and outside edges with TOP of balls facing upward. Once all are glued in place and glue is set, turn wreath over. Start filling in with various colored balls (colors of your choice) spacing the colors evenly around the wreath and using hot glue to hold in place with TOPS tucked in to hide them. Gradually fill in with smaller and smaller balls until completely covered. Hot glue the jingle bell door hanger to back of wreath so bells hang down in center of wreath. You could use bells and ribbon to create this same idea but for $1 at Dollar Tree, I opted for the door hanger. Hang your masterpiece when completed!